Get Spike Spencer's international bestselling books, formerly sold exclusively at cons, right here! Stories from the seamy underbelly of Anime conventions...and more. In this audio CD, Spike reveals the sillier (and naughtier) side of the Anime convention scene. From Hinti to Baptists there are some crazy goings on. It’s a lot of fun to listen to the craziness! For the newbs of the VO world. 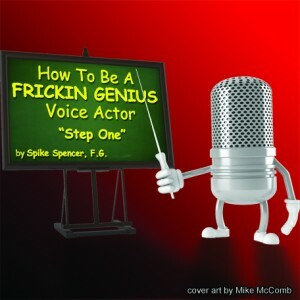 Learn the beginning steps and exercises to hone your voice over talent from Spike Spencer. Learn how to use your voice as an instrument and create real and fun characters to help you expand your voice arsenal...or to just entertain your friends! After years of "field research," the now happily married Spike Spencer compiles his learnings, faux pas, and foibles from dating into a humorous, poignant kind-of cook book. His goal for women to be well fed by their men, who know how to spice it up in the kitchen...and elsewhere! Learn from anywhere in the world...as long as there's wifi. All lessons are over Skype or FaceTime.